Please select the appropriate ticket type. 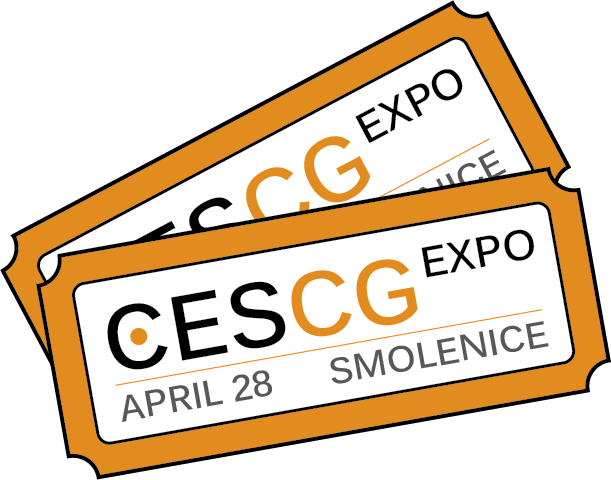 This ticket allows you to exhibit at CESCG EXPO. Note that the price can be only calculated cumulatively for your company as whole, hence the "FREE!" tag above is not relevant. If you agree, it will really help the EXPO organizers. If you do not wish that, we will need to tag you by a special prop to identify you in the recordings and remove your face. *Do you agree to appear in the aftermovie and public photos from EXPO'19? To reach the EXPO by public transport, you should ideally take the train departing at 10:13 from Bratislava main station. To get back you can take the train at 20:31 or earlier. We may organize a free shuttle bus from Bratislava if enough visitors will be interested. We will also try to convey car sharing. Do you wish to participate? From where do you travel? Your email address or phone number (will be shared with the rest of your crew). Cakes and drinks will be served during the EXPO for free. For a proper meal we recommend Pizzeria Halenár or Havran Pub. It is also possible to join the exhibitors and seminar participants for lunch or dinner at the castle. Please provide details on ingredients you are allergic to or you decided not to eat. We will come back to you and try to find a solution. For both visitors and exhibitors it is possible to reserve accommodation the night before and after EXPO. Breakfast is included.